The following is a possibly imperfect transcription of the last will and testament of Teague Matthews, Jr., a native of Somerset County who seems to have moved to the Broad Creek area in the 1770s. He and his wife, Mary Truitt, had several children, from whom many of the Matthews of Sussex County are descended; their descendants also include members of the Vinson, Hitchens, Cannon, Messick, and Lewis families, among others. Teague lived on the outskirts of what was then known as the Pocomoke Swamp, on the east side of Wimbesoccom Creek (Gray’s Branch), and attended the recently completed Broad Creek Chapel (Old Christ Church). He died in the spring of 1790. It’s unclear whether he was buried at Broad Creek Chapel or on his own land; wooden grave markers have been found at both locations. I give unto my beloved Wife Mary Matthews the place I bought of John Jones, with all the Improvements thereunto belonging during her natural life of Widowhood, and I order that she shall not be in anywise disturbed in the use of my present dwelling houses untill she either dies, marries or my Son Phillip builds her a House, on the said place called Jones’s place, the House to be framed, eighteen feet by twenty a Brick Chimney and reasonable furnished: also I give unto my said Wife One yoke of Oxen, one black Colt, one Bed and furniture, one Ewe and Lamb, one Cow and Calf. As for all the remainder of my moveable Estate I order that it may be equally divided between my Son James, my Son David, my Son Levi, my daughter Catharine and my daughter Prissa, and my desire is that the whole may be done in a quiet and peaceable manner. And I hereby leave my beloved Wife Mary Matthews and my Son Phillip Matthews, joint Executors of this my Last Will and Testament, In Witness whereof I have hereunto set my hand and Seal this twenty third day of March. One thousand Seven hundred and Ninety. Signed Sealed and delivered as the Testators Last Will and Testament being first duly published and pronounced in the presence of us Thos Conner. Molly Roach. Rebecca Conner. Memorandum this 27. Day of April 1790 before me Phillips Kollock Register appointed for the probate of Wills and granting Letters of Administration for the County afsd. 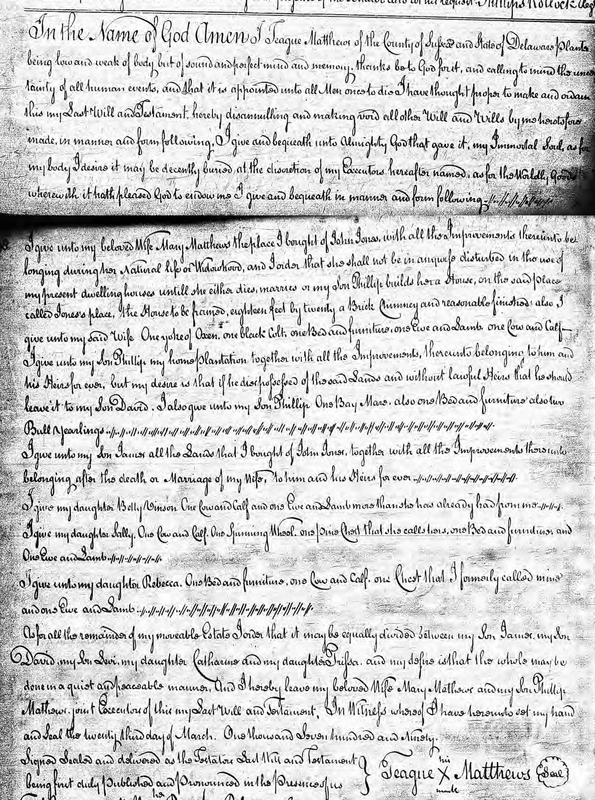 Appeared Thomas Connor and Rebecca Connor, two of the Witnesses to this foregoing Will, who being duly sworn on the Holy Evangels of Almighty God did severally depose and say that in their sight presence and hearing the Testator Teague Mathews did sign Seal publish and declare the same to be his Last Will and Testament, and that at the doing thereof he was of a sound and perfect mind memory and Judgment and that they and each of them together with Molly Roach subscribed the same as Witnesses in presence of the Testator and at his request. Phillips Kollock Reg. Laurel’s forgotten house of worship? Old Christ Church is probably Laurel’s best-kept secret. The locals know all about it, but the hordes of vacationers traveling up and down Route 13 have no idea that they’re within walking distance of a beautiful wooden chapel that has changed little since it was erected before the American Revolution. Located next to Chipman’s Pond, at a quiet wooded corner a mile or so east of the highway, the church and its ancient graveyard have lingered for generations, virtually untouched by time. And this is not one of those historical sites surrounded by fences and “keep out” signs; the public is invited into the magnificent structure several times a year for special services. I attended one such service this morning, and thoroughly enjoyed the sensation of stepping into the past. Old Christ Church in 1936. Source: Library of Congress. The church’s history is well-documented. It was built by Robert Houston, a wealthy shipbuilder and Presbyterian, between 1771 and 1772, and was originally known as Broad Creek Chapel. Houston was also the previous owner of the lot. At that time, the area was claimed by the Province of Maryland, and landowners were required to pay taxes (or tithes) to the established Church of England. The new “chapel of ease” at Broad Creek offered local parishioners a more convenient house of worship than the relatively distant mother church of Stepney Parish, located in what is now Wicomico County. The church’s subsequent history is summarized in many sources (including my incomplete and unpublished history of Laurel), but there’s a bit of a mystery concerning the history of the location prior to 1771. In Scharf’s (pronounced Scarf’s) History of Delaware, published in 1888, contributing writer Rev. Benjamin Douglass mentioned an intriguing possibility: “We are inclined to believe that [Christ Church] was not the first building erected on this spot. Tradition points to a prior structure, of which none now can give us any exact information.” Some researchers have dismissed the suggestion as just another of the many errors in Scharf’s works, but I’m not so sure. There is no known evidence of an earlier Anglican chapel at Broad Creek, but another denomination was active in the area 25+ years before Broad Creek Chapel was built: the Presbyterians. Is it possible that Old Christ Church stands on or near the site of a forgotten Presbyterian church? Rev. Charles Tennent, a Presbyterian minister, was preaching at “Broad Creek Bridge” as early as 1747, and a Presbyterian church was built on the northern branch of Broad Creek around 1760. This is the same branch that flows through Chipman’s Pond, which was known as Church Creek as early as (and presumably before) the 1790s. I don’t know the exact location of this early Presbyterian church; it burned down during the Revolution, and a new church was built at a new location between 1787 and 1791. It’s interesting that Robert Houston was a prominent Presbyterian as well as the owner of land adjacent to Church Creek. Perhaps the first Presbyterian church was located on his land. I’d like to learn more. It was not unusual for congregations to move churches from one location to another, so it’s possible that the poorly documented Presbyterian church built around 1760 stood on the site of Broad Creek Chapel at one time, but was moved prior to 1771. Perhaps the Presbyterian church built around 1760 wasn’t the first. Although it’s assumed that Tennent was preaching in private homes or outdoors in 1747, it’s possible that there was an early Presbyterian church which has been forgotten. More likely, in my opinion, the first Presbyterian church was built near the site of Broad Creek Chapel around 1760. 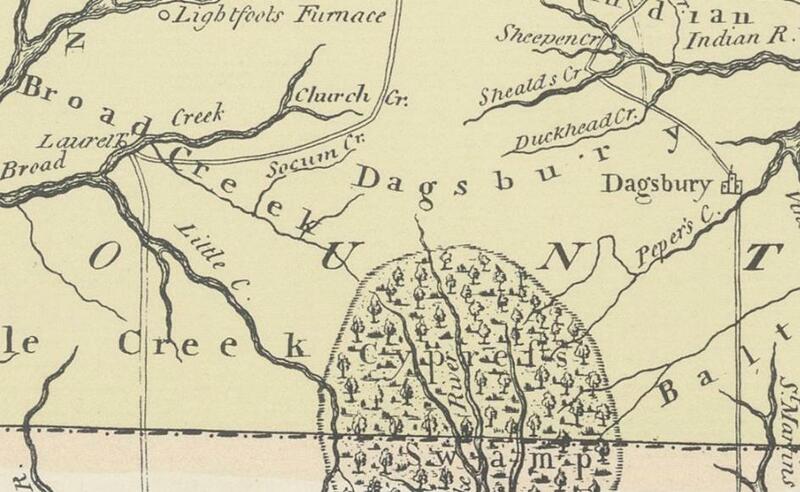 Logically, it wouldn’t have been located very far from Broad Creek Bridge, so in the mid-1770s, the older Presbyterian church and the new Anglican chapel probably stood near each other. More than a century after the Presbyterian church burned, the locals vaguely remembered their parents and grandparents saying that Old Christ Church was not the first house of worship located next to Church Creek, or Chipman’s Pond. This may have been the tradition that Rev. Douglass referred to.